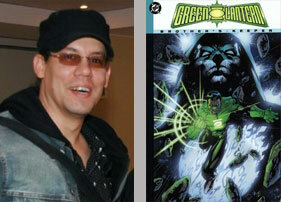 Dennis Calero and Rodney Ramos Appearing at Wizard Philly May 31st-June 3rd! Philadephia-- Wizard World Philly started today, May 31st, ya'll, continuing all weekend. And as comic lovers converge on the city of brotherly love, creators from around the world will be there enforce. When William Penn put together two Greek words ("philos", meaning "love" and "delphos", meaning "brother"), he named the city of Philadelphia. Wanting to forge a new type of land founded on those ideals, since he himself had fled religious persecution from England. However, the name is not just random word play. Penn envisioned the city in Pennsylvania as one where people of all backgrounds could come together in celebration. Having survived it's own share of adversity, Philly is a proud city of cultural diversity and rich neighborhoods. A melting pot of music and the arts. What an amazing place to host a show that offers so much variety in viewpoints, mediums and creativity all under one roof, itself! We are certainly happy to be a part of it, and this year, Eva Ink Artist Group is happy to announce the appearances of Dennis Calero and Rodney Ramos at this mainstay event! 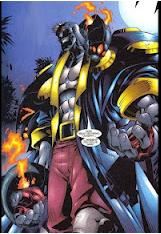 Dennis Calero is the award winning and internationally recognized artist of "X-Men: Noir" and "Legion of Superheroes." He has also leant his talents to CCG Properties such as Magic and Legend of the Five Rings, as well as Dungeons & Dragons. 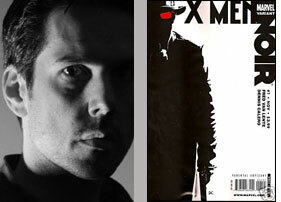 His work includes "X-Men Noir : Mark of Cain," "X-Factor," "28 Days Later: The Aftermath," "Cowboys and Aliens," "Dark Tower," "Fallen Angel," "Hawkgirl," "Star Trek: The Next Generation," "Supergirl" and the "Legion of Superheroes," Magic The Gathering, Countdown to Final Crisis, "Wolverine: First Class "and "JSA Classified." 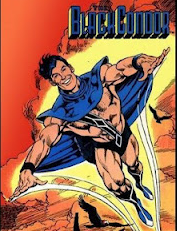 During his tenure on "X-Factor" the title was nominated for the Harvey Award for Best New Series. Recent works include “Captain Victory,” “Witchblade,” and “Lone Ranger,” for Dynamite, Marvel Trading Cards, and a few new things to be announced very soon. 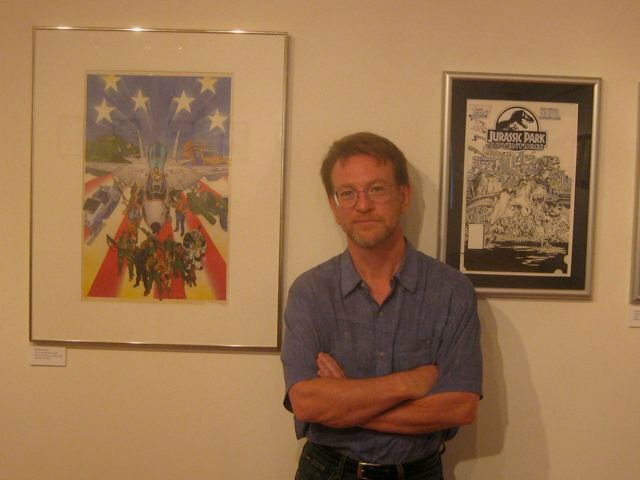 Calero also co-founded Atomic Paintbrush, one of the first computer-coloring companies working in the comic-book field. 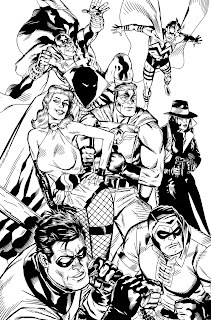 Rodney Ramos: Currently working for DC Comics. 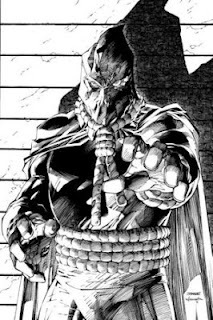 He has worked on many various titles including 52, Countdown, Batman ,JSA, Black Adam, the Award-Winning Transmetroplitan and many other titles to long to list here. He worked for Valiant/Acclaim comics, Marvel Comics UK, Marvel comics on Amazing Spider-Man, Toxin, X-Men, Nick Fury, Peter Parker, Iron Man and various others titles. 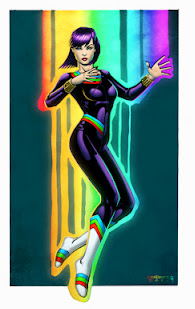 In addition to working with Legendary Comics, Rodney's recent work can also be seen on his Marvel Trading Cards work. Calero and Ramos will be at the Philadelphia Convention Center all days of the show in Artist Alley. Check the schedule for panel times or special events. Signings and sketches are available at their tables. Ever Wonder What Michael Golden has been Working on? !-- Now you Know! Thanks to our friend Larry Nolan, here is a partial list of all credits Michael Golden. It answered the question we most often get--- "So what have you been working on?" -- at shows! And serves as a neat index for those of you that want to get your works signed by this prolific artist. This may not be a complete list though, ya'll. Got something to add, let us know! As "Before Watchman" continues its road to release this July, DC Comics has slowly released new details for the series, which most recently two new variant covers. 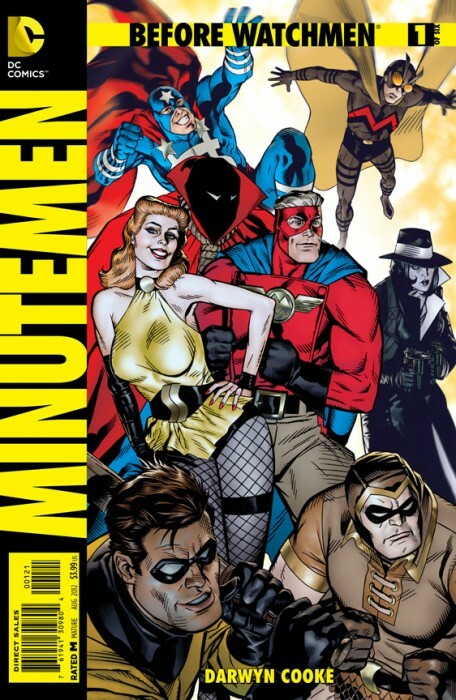 The two newly revealed variants for Darwyn Cooke's "Minutemen" #1 are by Michael Golden, featuring the entire team roster, and by Jim Lee and Scott Williams featuring Hooded Justice in the criminal line-up series of variants running throughout all the "Before Watchmen" books. 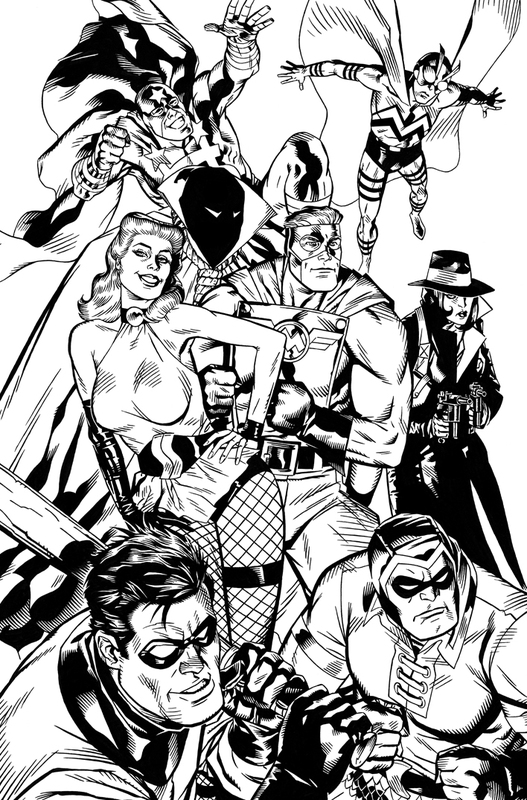 Michael Golden says of his cover, "I wanted to do a cover of the whole group, that showed something about the personalities of each character." 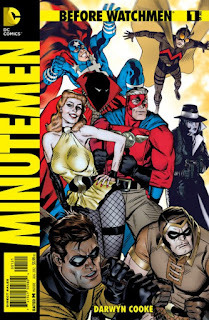 Check out the variant covers below and stay tuned to CBR News for more on "Before Watchmen." 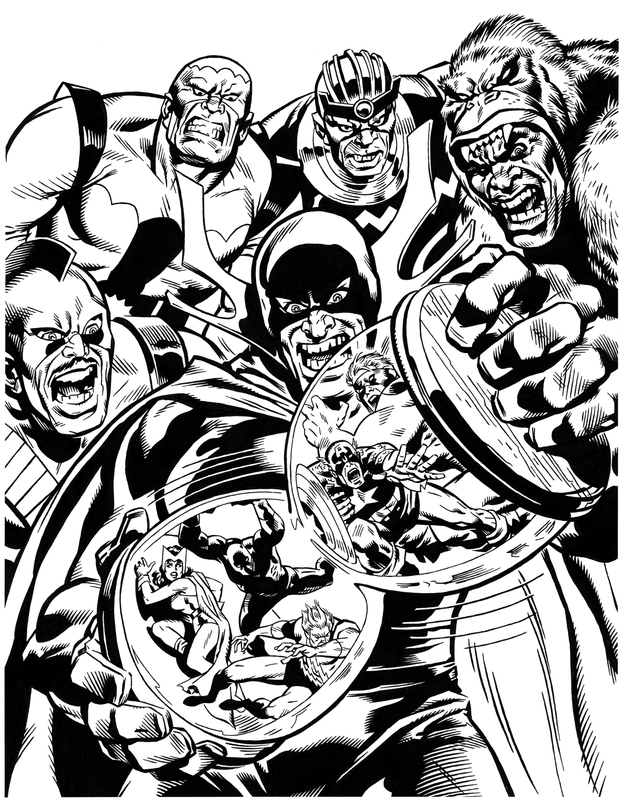 Above, finished cover by Michael Golden, inked version by Michael Golden. Variant cover by Jim Lee. 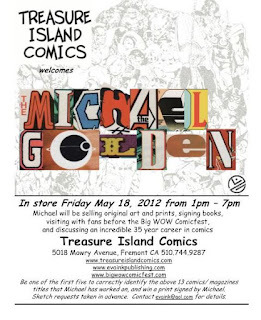 Michael Golden at Treasure Island Friday/ Golden and Mark Texeira at Big Wow This Weekend! Fremont / San Jose, CA -- Artist Michael Golden will be making a special pre-con appearance at Treasure Island Comics in Fremont, California, May 18th. 1-7 PM. Take a look at the flyer below. If you are one of the first five to correctly identify the 13 comics/magazine titles that Michael has worked on, you'll win a signed print at the store event! Even then, stop by the store for books, prints, and sketches. A great way to kick off the weekend activities at the Big Wow Comic Fest in San Jose, May 19th-20th. Which will feature an appearances not only by Michael Golden and Mark Texeira but many more! Renee Witterstaetter will also be on hand with copies of her newest books "Nick Cardy: The Artist at War," and "Joe Jusko: Maelstrom." In addition, the artists will have pieces in the Big Wow art auction, as well as originals of their own for sale in artist alley. 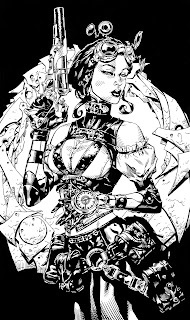 Above, inks on Lady Mechanika, and Avengers #79 by Michael Golden. Items for the Big Wow Art Auction. Michael Golden Inks on Avengers #79, and Lady Mechanika-- Up for Auction at Big Wow Convention! San Jose, CA-- Each year at Big Wow in San Jose, the show provides bluelines of some amazing art, and the amazing artists attending the show then do their versions of inking the pieces. This year, Michael Golden is attending Big Wow-- one of his favorite shows. Here is Golden's take on Joe Benitez' Lady Mechanika! Up for auction too will be this cool "Avengers #79" inking job by the Golden one. The original pencils are by the legendary John Buscema. For information on ordering a commission from Michael Golden, contact his agent Renee at: evaink@aol.com. Michael will have books and prints available at the show as well. The show will be May 19th and 20th! Hope to see you there. 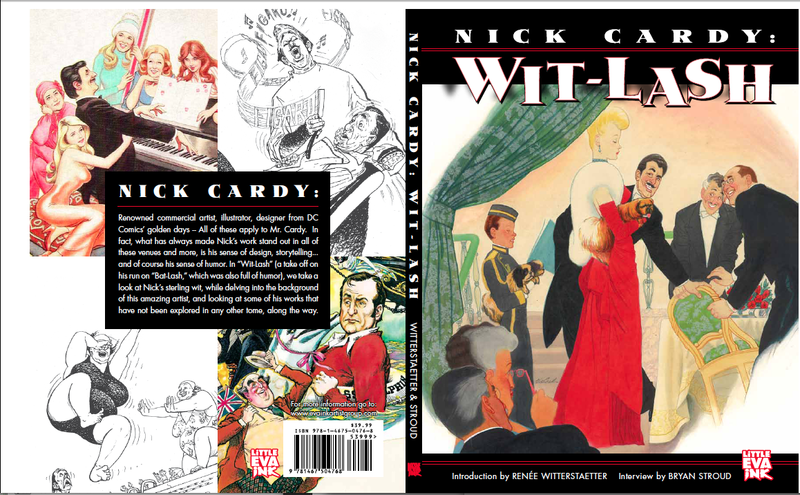 Hey, everyone, this baby is about to head off to the printers. I've been living with it for while now, but it's time to send it off to college, and turn it's room into my sewing suite. Seriously though, it's always a pleasure to work with Nick and put these books together. It's an honor. I'm consistently warmed by his friendship, his faith, and of course his work. 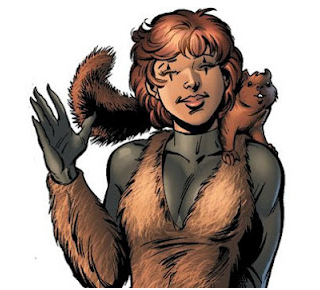 19 Superheroes and Their "WTH" Superpowers! I had to laugh at this one True Believers. The Huffington Post seems to have taken an interest in our crazy world of super heroes (could it possibly be because of the opening of the Avengers movie... Naw.... oh WAIT, they admit that's why!) and done their research to find some of our...uh...stellar cast of characters with some rather unusual super powers. Well, yeah, to us they make perfect sense. We're use to them. 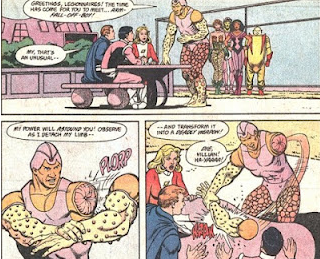 But to the outside world, Matter Eater Lad seems strange. Go figure. Anyway, here, by way of The Huff, are their top 19 choices for "What The Heck" super-powers (and yes, they used another word, but I'm gentile. LOL). With "The Avengers" hitting theaters this weekend, superheroes are on everyone's mind. But not all superheroes are as cool as Iron Man, Thor, The Hulk, and Captain America. In fact, some superheroes are just plain bizarre. 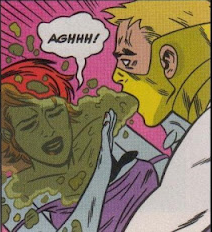 Sure, most comic book heroes have the abilities of flight and super strength, but how many can vomit acid? Or communicate with squirrels? Or make their own arms fall off? Well, the 19 heroes below can do all that and more. Some of these characters you just have to see to believe. We don't expect an "Avengers"-type movie with this cast of characters, but we can at least appreciate them for the utterly absurd realities they have created within the comic book universe. Matter-Eater Lad is from the planet Bismoll, where poisonous microbes made all food inedible, forcing the planet's inhabitants to evolve to have the ability to eat any form of matter. Man-Eater Lad can also eat at super-speeds and consume matter otherwise thought to be indestructible, meaning that theoretically, he could eat Superman. 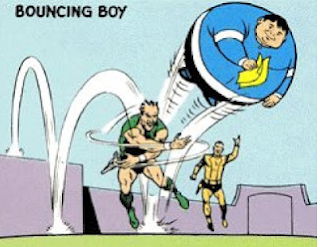 Bouncing Boy made his comic book debut in 1961 after young Chuck Taine accidentally drank an experimental super-plastic formula he mistook for soda pop. He then gained the ability to inflate his body like a ball and bounce around without injury. 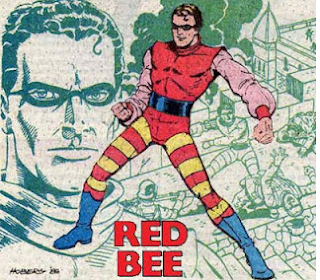 Red Bee: When Rick Raleigh isn't working as the assistant to Superior City's District Attorney, he's fighting crime under the guise of Red Bee. Red Bee has a swarm of trained bees stored in his belt to unleash on criminals at the ready. It is unknown how he trained the bees or how he is able to keep them in his belt (don't ask too many questions) but Red Bee is not to be confused with Yellowjacket, who can also control bees. Zeitgeist: Alex Cluney has a very distinctive mutant power which enables him to spew acidic vomit from his mouth. Tragically, he discovered his power while making out with a girl; he vomited acid all over her and burned her face (thankfully she survived). His vomit is highly acidic, able to burn through 10-centimeter-thick steel in less than 30 seconds. Hopefully he also carries mints. 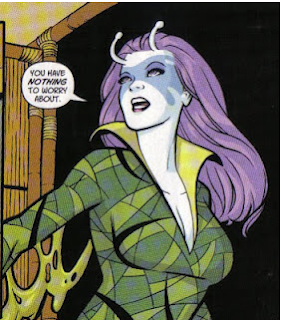 Infectious Lass: Drura Sehpt hails from the planet Somahtur, whose inhabitants can easily infect others with various diseases while they themselves remain immune to its effects. After travelling to Earth, Drura became Infectious Lass and began fighting crime, although her powers sometimes do as much harm as they do good, especially when she accidentally infects other heroes with illnesses. Oops! 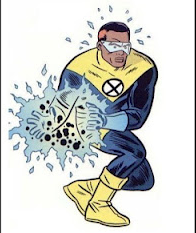 Anarchist, one of the founding members of the X-Statix mutant superhero group, has the ability to secrete acidic sweat. His sweat allows him to project acidic blasts of energy. He and Zeitgeist should probably talk. 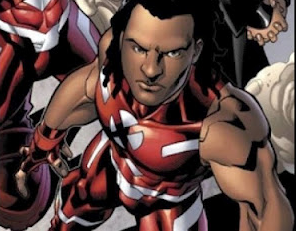 Tag: Brian Cruz's genetic mutation allows him to force people to uncontrollably run away from whatever object or person he chooses, hence the alias "Tag." 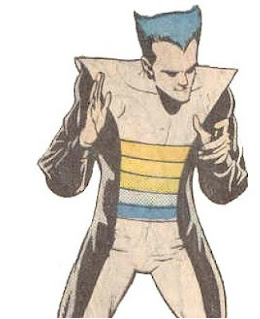 He uses a psionic signal which forces anyone within a radius of approximately 100 feet to either run away from or run directly at a target source. When applying his power, he always yells, "You're it!". Clever. 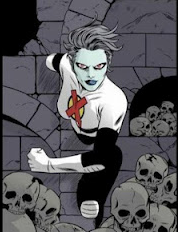 Dead Girl's mutant powers were activated by her death (shocker) which allowed her to continuously reanimate her corpse and come back to life, essentially making her immortal. Additionally, she can communicate with other dead beings, survive without any food, water or oxygen, and control severed parts of her body. And guys, she's single. Stone Boy: Dag Wentim is a native of the planet Zwen, where people developed the ability to turn themselves into stone for long periods of hibernation. Originally, he was unable to move in his stone form and was only able to transform into an immovable, nearly indestructible statue of himself, which was not very useful in battle (his teammates would sometimes drop him on villains). However, he eventually gained the ability to move while in his stone state. 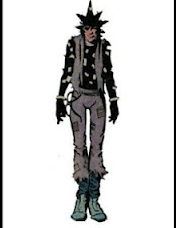 El Guapo: Robbie Rodriguez, another member of the X-Statix mutant group, has no discernable powers aside from a telepathic connection to a flying, seemingly sentient skateboard. He can control the skateboard with his mind, though the skateboard can also act through his subconscious thoughts. Sadly, after the skateboard falls under a curse, it flies out of control and impales El Guapo through the heart, killing him. Ironic, isn't it? And that's their 19 picks at Huffington Post, ya'll. Apologies to any of my friends that may have created these characters. I didn't pick 'em... and...I don't know... In the course of working in comics, I know I've come across 19 superheroes with powers just as strange if not stranger than these. I'll think on it. In the meantime, feel free to tell me your your top 10 would be! "Joe Jusko: Maelstrom" in Stores Now, And Why I Think You'll Like It! The newest book from Eva Ink Publishing is hitting stores even as I type. If you haven't ordered your copy yet, you still can. Just ask your local store owner. Or, you can order a copy from us at www.evainkartistgroup.com as well. This is a hardcover, full color book, featuring some wonderful paintings and sketches by Joe that haven't seen print in any other book. 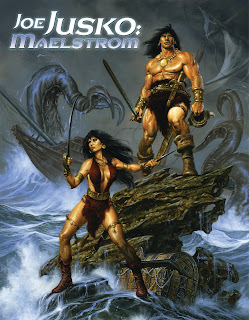 "Joe Jusko: Maelstrom," follows our successful sketchbook from two years ago, "Joe Jusko: Savage Beauty." You can own them both without any duplication of art. An assurance that we like to give you here at Eva Ink Publishing. So that's the biz info for ya. Why do I think this would be a great book to own? Well, if you know Joe's work already, then you are someone I don't really have to tell. If you don't know Joe's work, I think you'll truly enjoy seeing it if you like pop culture, fantasy, superhero and adventure art, done with a fine art bent. But perhaps I can say it best with the actual intro from the book, which appears below. One of the things I treasure the most about having worked in comics as my career is that I’ve had the opportunity to work with amazing people. My life has indelibly been enriched by the likes of Mark Gruenwald, Jim Salicrup, Craig Anderson-- talented editors and mentors all. And of course, by the artists that I’ve met, hired, and created comics with, along the way. I love good storytelling-- ranging from Alex Toth , to Will Eisner, to Nick Cardy, to Michael Golden. It’s what attracted me to this medium to begin with… my feeling that a comic, when done well, is like a movie on paper. And as the editor I get to be the director of putting my “film” crew together. Simply put.... it IS fun. 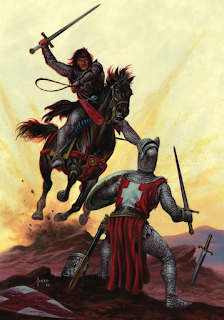 Artistically, I have always been drawn to a myriad of styles: Arthur Rackham, Maxfield Parrish, Norman Rockwell, and the incomparable Frank Frazetta, among them. I do so love the painters… it was such a thrill--when I was starting out as green as moss on a tree-- to work with, and get to know, folks that awed me-- artists like Earl Norem, Jim Silke, Mark Texeira, Mike Kaluta, Dave Stevens… and of course, Joe Jusko. I vividly remember being in Paris with Jusko and Michael Golden a few years ago. And our friend Dynamo convinced Joe and I to go out on the town in the City of Lights. “All the places close at 2 a.m. afterall,” he implored. Hours later, trading stories with Joe and our Parisian friends, during a magical evening of trading stories, where hours seemed to have been lost in some time machine, we were dismayed to see the sun coming up outside the cut glass windows of the Art Nouveau bar near Gare du Nord. It was 6 o’ clock in the morning! “What? We thought you said all the bars close at 2?” “They do!” Exclaimed Dynamo. “All of them except THIS one.” Joe and I dashed to the hotel, grabbed our bags, and piled into a car waiting to drive us to The Netherlands that day, as Golden sauntered out all bright and bushy tailed from a good night’s sleep. Never a dull moment. Across the square, Joe sees a feral feline, and starts to walk towards it. I wish I could explain to you… OH...the blood curdling scream that emanated from that cat, echoing off all the buildings, and probably waking even the ghosts therein, as it bolted across that formerly peaceful square like it had seen a Doberman…and how the laughter from all of us--including Joe-- added to the calliope. I could go on. But it would involve chicken fights, rolling M&M’s, Meerkats, leaning sisters, eggs in coffee pots, waitresses, …and...and... I just don’t have the space. You notice I’ve not mentioned much about his art. Just a technicality. I really don’t have to. It’s undeniable that Joe Jusko is a master painter. That’s why I wanted to not only publish this book “Joe Jusko: Maelstrom,” but also our previous tome “Joe Jusko: Savage Beauty.” His talent is evident. A gift that will last long after my memory fades. What one doesn’t always get a chance to see, however, is the essence of a human being. Who they are--The spontaneous laughter, the intelligence behind even the jokes, the honesty, and a loyalty one finds in only true friends. But I think that essence of who Joe is… comes through in his artwork in a most substantial way. It’s there. It’s what compels you to keep looking for more and more of his pieces. I’m happy to provide yet a new opportunity with this very book: A perfect storm. A Maelstrom. This combination of intent and execution. Artist Michael Golden will be making a special pre-con appearance at Treasure Island Comics in Fremont, California, May 18th. A great way to kick off the weekend activities at the Big Wow Comic Con in San Jose, May 19th-20th.